1999- 2005. 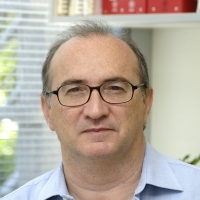 Investigador Científico del CSIC. Miranda, M. P., Fereres, A., Appezzato-da-Gloria, B., Lopes, J. R. S. 2009. Characterization of electrical penetration graphs of Bucephalogonia xanthophis, a vector of Xylella fastidiosa in citrus. Entomologia Experimentalis et Applicata 130: 35-46. Fereres, A. 2009. Plant virus epidemiology: controlling epidemics of emerging and established plant virus diseases - the way forward. Virus Research 141: 111-112. Fereres, A., A. Moreno. 2009. Behavioural aspects influencing plant virus transmission by homopteran insects. Virus Research 141: 158–168. Canto, T., Aranda, M. A., A. Fereres. 2009. Climate change effects on physiology and population processes of hosts and vectors that influence the spread of hemipteran-borne plant virases. Global Change Biology 15, 1884–1894. Garzo E., J.P. Bonani, J.R.S. Lopes , A. Fereres. 2012. Morphological description of the mouthparts of the Asian citrus psyllid, Diaphorina citriKuwayama (Hemiptera: Psyllidae). Arthropod Structure & Development. 41: 79-86. Rodríguez-López MJ, Garzo E , Bonani JP , Fernández-Muñoz R , Moriones E , Fereres, A. 2012. Acylsucrose-producing tomato plants forcesBemisia tabaci to shift its preferred settling and feeding site. PLoS ONE 7(3): e33064. Moreno, A., W. F. Tjallingii, G. Fernandez-Mata and A. Fereres. 2012. Differences in the mechanism of inoculation between a semipersistent and a non-persistent aphid-transmitted plant virus. Journal of General Virology 93: 662-667. Moreno, A. and Fereres, A. 2012. Virus diseases in lettuce in the Mediterranean basin. Advances in Virus Research 84: 247-288. DOI:10.1016/B978-0-12-394314-9.00007-5. Carmo-Sousa, M., Moreno, A., Garzo, E., A. Fereres. 2014. A non-persistently transmitted-virus induces a pull–push strategy in its aphid vector to optimize transmission and spread. Virus Research 186: 38–46. Hily JM, García A, Moreno A, Plaza M, Wilkinson MD, Fereres, A., Fraile, A., F. Garcia-Arenal. 2014. The relationship between host lifespan and pathogen reservoir potential: an analysis in the system Arabidopsis thaliana-Cucumber mosaic virus. PLoS Pathog 10(11): e1004492.